While we are recovering from our recent adventure, hiking the Camino de Santiago + prepping for our upcoming wedding, we’ll be featuring weekly house sitters here on our digital home. 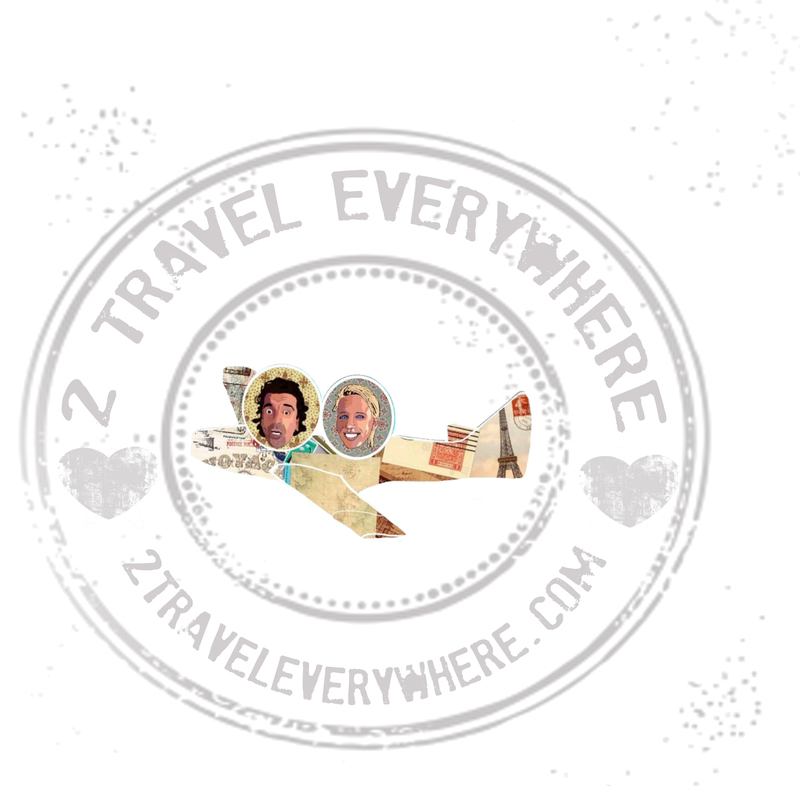 If you are interested in guest posting contact Shannon at info@2traveleverywhere.com. And you can read all about our adventures on El Camino here. This post is brought to you by Brenda Tolentino from Dish Our Town. My husband and I have traveled to Italy five times together before, three of those times were with our daughter. Prior to meeting each other, I went to Rome on my own once and Andrew (my husband) can’t even count how many times he’s been. As you can imagine, we really enjoy Italy. 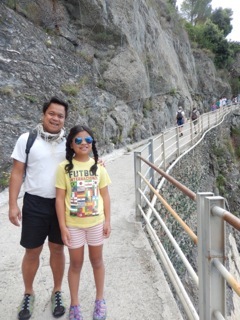 This, however, is the first time we’ve been to Cinque Terre (“Five Lands”), on the Ligurian Sea, which is also a national park in Italy. Both Andrew and I recently read a book by Jess Walter called “Beautiful Ruins” which is about a fictitious sixth town on the Cinque Terre. We loved the book so much we had to put it on the top of the bucket list. We really wanted some “downtime.” Being New Yorkers, we are always so ridiculously busy that we craved going to a “sleepy” town to truly relax and dream a little. Again being crazy busy New Yorkers, we really wanted to be surrounded by nature. 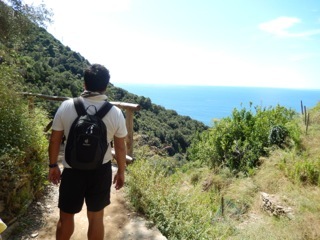 We knew that Cinque Terre was a popular hiking destination and being a national park, nature was all around. Cinque Terre is made up of five towns; in order from north to south, they are: Monterosso Al Mare, Vernazza, Corniglia, Manorola and Riomaggiore. Monterosso Al Mare is the only town of the five that is built on flat land. It’s also the biggest and the I think the most convenient for tourists. Since we have a 10-year-old daughter, we thought the most convenient town of the five would suit us best. We arrived at Monterosso from Modena by train on July 26, 2014. When we got out of the train station, we were greeted right away by nature; the sea was right in front of us as we exited. YES! if it weren’t for our luggage, we would’ve jumped right into the ocean! First order of business was to find our hotel, which was a 15-minute walk from the train station to the old town, Albergo Marina. This was a quaint family hotel that serves breakfast and a midday snack, both of which are included in the price: a great deal for 170 euro a night for a triple room. We dropped our bags and immediately headed out to aperitivo hour, our favorite time in Italy, where bars serve food for free when you order drinks. Andrew and I both ordered Aperol Spritz and my daughter has a water. We devoured the peanuts, olives and capers from Enoteca da Eliseo. We thought about going to the sea, but it was closing in on dinnertime, so we decided to just do our Passegiata (evening walk before dinner) and choose a place to eat. After dinner, we walked the town again and “happened” upon an open-air documentary movie they were showing right by the sea about the devastation of one village in this region called Pignone. The movie was in Italian but with English subtitles. I felt like I was transported into one of my favorite foreign films, Cinema Paradiso – that’s when my mind started to relax and time had finally slowed down. On our first full day, we walked both new and old town to get acclimated with the whole town. In the afternoon, it was time to hit the beach! We decided to treat ourselves and rented two chairs and an umbrella from Bagni Eden in the Fegina (new town). It was a great beach with mostly pebbles instead of sand. The water was a bit cool, but refreshing and not very salty. It was a great day spent with nature. 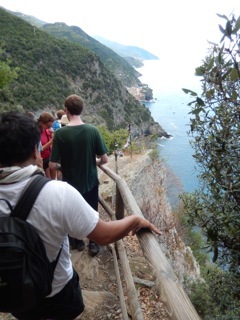 The next day, we woke up for breakfast at the hotel and briskly got ready for our hike from Monterosso to Vernazza. This hike is supposed to be the hardest of the hikes so we decided to tackle it first. My daughter is slightly asthmatic, so she took her asthma pump before we headed over. 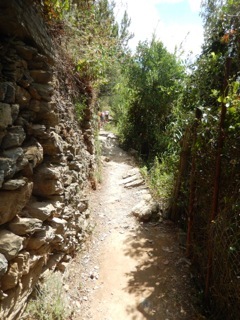 Our host, Marina, told us that the hike starts towards the old town and where four-star Hotel Porto Roca was located. 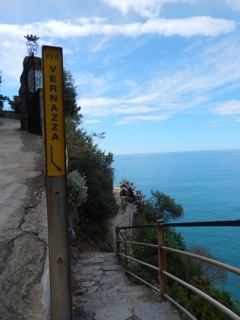 We headed towards that sign and saw another sign saying “per Vernazza”; we followed the sign up and right away, the hike began. Ten minutes into the hike, we stopped at a hut to purchase the tickets for hiking, 7.50 euros for adults and 4 euro for a child. The hike we took was labeled #2, which was the most organized hike, with red and white paint along the rocks to guide you to Vernazza. We saw vineyards, lemon trees, some birds, geckos, frogs, different types of trees and flowers, lots of cacti; just lots of nature all around. The most exciting was to see small streams for cooling down. It was a very steep hike up for the first 45 minutes, but once we got to the hike’s summit, going back down was quite easy. Although we had to be careful with the wet rocks, because it can be quite slippery. Some parts of the hike were also extremely narrow, so we had to be watchful. 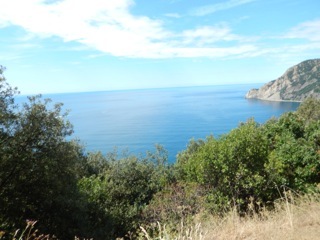 Soon, we started to see the town of Vernazza in the distance. 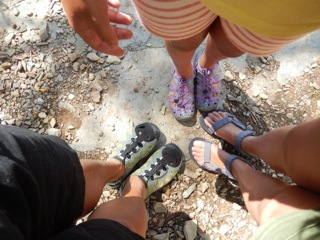 We all started to get excited for the descent. As we slowly arrived, a saxophone player was playing a welcome tune for the hikers! We contributed to his stash of cash for making the entrance to Vernazza so magical for us! 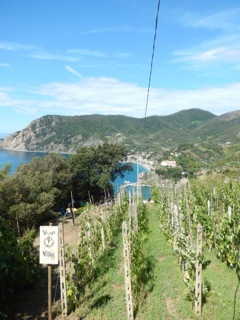 As we touched down on the town, I checked my Fitbit for the number of steps we took from the hotel to Vernazza – 8,829! We made the hike in two hours as opposed to the hour and a half that everyone says it should take, because I took so many pictures. 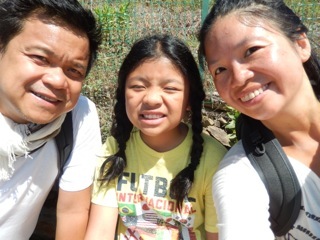 All in all, we thought the hike was quite easy and loads of fun. Children that are fit can do the hike easily with stops along the way. After lunch, Andrew and I wanted to hike from Vernazza to Corniglia, which was supposed to be the steepest hike and take another hour and a half. Our daughter, however, wasn’t up for it because it was extremely hot. Instead, we took the ferry boat back to Monterosso, which was very special, for 10 euros. We actually never got to do any other hike during our time in Cinque Terre; because of very rainy conditions, many hikes were closed. Also several hikes were still closed for repair after the horrible October 25, 2011 storm (which the documentary I mentioned earlier is based on) that devastated this region. Even without hiking though, all five towns are “hikes” just getting around because all of them are built along the very special mountain. 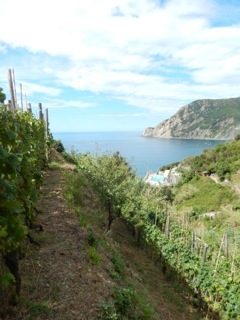 I hope you make it out to Cinque Terre soon and bring the kids! They will definitely enjoy nature and the freedom. One last thing… on July 30, Monterosso has a special pirate festival, which is not to miss! Also, the market day is Thursday there and is another fantastic local experience. 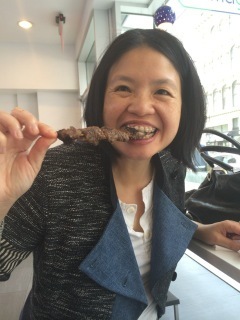 I’m Brenda Tolentino, I started Dish Our Town in May 2014 to share my love of food and travel. Most of us can’t afford to travel as frequently as we would like, whether it be time or resources, but I’d like to think that a certain dish can transport you to that special place, at least for a moment. Travel with me and experience the world one dish at a time. I would be so honored to share our dreams. You can join in on our adventures on Facebook, Instagram, and G+.